We've taken an early look at the district records in Class 2-1A and both 8-Man classifications and tried to clarify the playoff picture as much as possible with two weeks remaining. Below each district breakdown, you'll see the match-ups for Week 8 with the team's district record included. Note that (ND) refers to a non-district game. We will update district scenarios for all classifications next week. In the meantime, remember to visit Kpreps' complete District Standings. Please feel free to contact us if you know something is incorrect – contact@kpreps.com. District 1 – Troy has clinched the district championship by virtue of wins over Jefferson County North and Doniphan West. The Week 9 match-up between the Chargers and Mustangs will likely decide the runner-up spot. Maranatha must win at Jefferson Co. North this week and get help in the form of an Immaculata win over Doniphan West in order to have a chance at the playoffs in their first season as a KSHSAA football member. District 2 – Onaga is already the district champion having beaten Valley Heights, Jackson Heights, and Wabaunsee. Valley Heights can win the runner-up spot by beating Jackson Heights in Week 9. Valley Falls and Wabaunsee each would need to win out and get help to reach the postseason. District 3 – With two weeks to go, Marion and Mission Valley are both 2-0 in district play. The Warriors and Vikings will meet Week 9 in Eskridge. Northern Heights has battled numerous injuries, but the Wildcats can get back in the mix with a win this week at home against Mission Valley. Herington is the only team in the district that has been eliminated having lost their first three district games. District 4 – Olpe is the District 4 champion after starting 3-0 including a 36-28 win over Lyndon last week. The Lyndon Tigers will be heavily favored against Yates Center this week, before a home game with Whitewater-Remington will likely decide the second playoff spot. District 5 – Sedgwick and Moundridge lead the district at 2-0, while Sacred Heart is 2-1. Moundridge hosts Sacred Heart this week and travels to Sedgwick in Week 9. Sedgwick holds the head-to-head advantage against Sacred Heart by virtue of a 35-7 win over the Knights in Week 5. Inman is the only team eliminated after starting district play 0-3. District 6 – Phillipsburg and Ell-Saline are each 2-0 in District 6. The top-ranked Panthers meet the Cardinals this week in Brookville. Smith Center sits at 1-1 and can eliminate Bennington with a win this week. Republic County is the only team already eliminated by virtue of their 0-3 start to district play. District 7 – Oakley and La Crosse are each 2-0 through the first three weeks of district play. The Plainsmen and Leopards will meet Week 9 in Oakley. Plainville sits at 1-1 and will host Oakley this week, while Ellis still has a chance at 1-2 but will need some help. District 8 – Meade and Elkhart are both 2-0 in District 8 and the Wildcats and Buffaloes meet this week in Meade. Sublette and Syracuse have each won a district game, while Stanton County is 0-2. Any of those three teams can get in, but it will take some major upsets. District 1 – Marais des Cygnes Valley scored with 37 seconds remaining and kicked a PAT to edge Uniontown 37-36 and take control of District 1. The Trojans also have a 34-26 win over Waverly. Uniontown and Waverly each sit with two wins and will meet Week 9 at Waverly. District 2 – Udall and Cedar Vale-Dexter are both 3-0 and in prime position to earn both playoff spots. The Eagle and Spartans meet this week in Dexter with the winner clinching a playoff spot. Oxford, Sedan, and West Elk each sit at 1-2 and have a chance to get in. Only Central Burden is eliminated going into Week 8. District 3 – Peabody-Burns and Burlingame are the two teams unbeaten in District 3. The Warriors and Bearcats happen to play this week in Burlingame. Peabody clinches the district championship with a win, while Burlingame still has a date with Madison in Week 9. The Bulldogs will be heavy favorites this week at Flinthills. Rural Vista and Flinthills have already been eliminated. 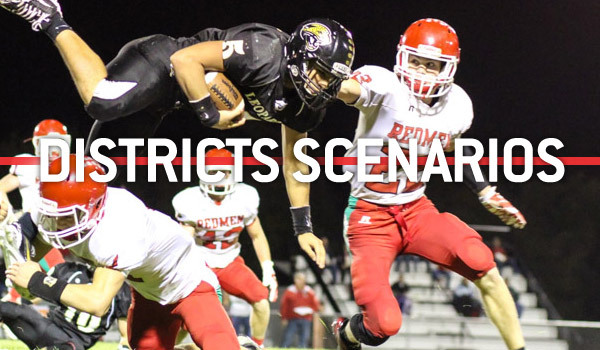 District 4 – Only three teams remain in contention for the two playoff spots in District 4. Hanover and Osborne, ranked No. 1 and 2 in the Kpreps poll, are on a collision course for a Week 9 showdown. This week, Osborne hosts Wakefield which is 4-1 in district play and can still grab a playoff spot. The remaining teams have been eliminated because they cannot equal the four wins of Hanover, Osborne, and Wakefield. District 5 – Central Plains and Solomon have each won their first three district games and meet in Claflin this week. An Oiler win will sew up the district championship, while Solomon still has to play a tough Little River team. District 6 – Pratt-Skyline has taken control of District 6 with remaining games against Kinsley and St. John. South Central is in a good position to get a playoff spot, but may have to beat Kinsley in Week 9. Kiowa County has a good chance to get to 3-2 in district play, but will have to hope for a three-way tie for second since they’ve lost to Skyline and South Central. District 7 – Perhaps the biggest game in the state will occur in District 7 where No. 4 Spearville will take on No. 5 Hodgeman County. The Lancers and Longhorns are each 3-0 in district play. Spearville clinches the district title with a win since the Lancers have already beaten Ness City. Hodgeman County will still have to go through the Ness City Eagles in Week 9. District 8 – District 8 has come down to a three-team race between Oberlin-Decatur Community, Atwood-Rawlins County and Hill City. Oberlin-Decaur Co. and Atwood-Rawlins Co. are both 4-0 and meet this week in Atwood. Hill City needs to keep pace with a win over Logan-Palco and beat Oberlin in Week 9. District 1 – Axtell has long been competitive in District 1, but hasn’t reached the playoffs since a semifinal appearance in 2008. The Eagles have been blocked by the likes of Baileyville B&B and Hanover. Now Axtell is 3-0 and can clinch a playoff spot by beating winless Blue Valley Randolph. Both Linn and Pike Valley are 2-1 and meet this week. Frankfort and Southern Cloud will need some help. District 2 – Chase has rolled to a undefeated season and the Kats will be heavily favored in their final two district games with Tescott and Burrton. Sylvan-Lucas Unified and Centre-Lost Springs are both 2-1 and will battle each other in Week 9 in a game that will likely decide the second playoff spot. District 3 – Top-ranked Chetopa has rolled to an unbeaten season and stands at 3-0 in district play. Hartford and Southern Coffey County both sit at 2-1 with the Titans holding the head-to-head advantage having edged Hartford 28-22 in Week 5. Southern Coffey County can likely clinch the second playoff spot by beating a solid Colony-Crest team this week. District 4 – South Barber came into the season on many people’s short list to compete for a state title, but the injuries have slowed the Chieftains to a 3-4 record. Now, South Barber has to fight for a playoff spot and will likely need to upset unbeaten Argonia-Attica in Week 9. Caldwell is the other team in the thick of this district race and the Blue Jays hold the head-to-head over South Barber by virtue of a 46-28 win last week. District 5 – This district looks like it is a two-team race with Minneola and Stafford both sitting at 3-0. The Wildcats and Trojans will be heavy favorites to win over Bucklin and Cunningham, respectively this week. That would set up a showdown for the district title at Stafford in Week 9. District 6 – Ingalls is unbeaten in district play and 7-0 on the season. The Bulldogs have remaining games with Deerfield and Fowler. Satanta is also in the mix having won two district games. The Indians can close in on a playoff spot by beating Rolla this week, but a Week 9 game against Deerfield may ultimately decide the district runner-up. District 7 – Victoria is the district champions having already defeated Beloit St. John’s-Tipton and Thunder Ridge. The Knights are 3-0 on the field, but will be 4-0 in the standings thanks to Natoma’s forfeit loss to Northern Valley last week. The forfeit means that Natoma will have to forfeit its remaining district games per KSHSAA rules. The district runner-up spot will likely come down to this week’s showdown with No. 4 Thunder Ridge traveling to No. 5 St. John’s-Tipton. District 8 – Sharon Springs-Wallace County is off to a 4-0 start and can clinch a district title with a win against winless Cheylin this week. Hoxie is 4-1 and can clinch a playoff spot by beating winless Golden Plains this week. Wallace County holds the tie-break over Hoxie by virtue of a 24-16 win over the Indians in Week 4.